A survey of 2,462 Advanced Placement (AP) and National Writing Project (NWP) teachers finds that digital technologies have helped them in teaching their middle school and high school students in many ways. At the same time, the internet, mobile phones, and social media have brought new challenges to teachers. In addition, they report that there are striking differences in the role of technology in wealthier school districts compared with poorer school districts and that there are clear generational differences among teachers when it comes to their comfort with technology and its use in their classrooms. 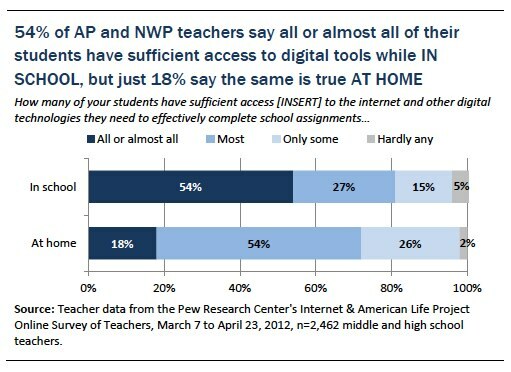 At the same time, 75% of AP and NWP teachers say the internet and other digital tools have added new demands to their lives, agreeing with the statement that these tools have a “major impact” by increasing the range of content and skills about which they must be knowledgeable. And 41% report a “major impact” by requiring more work on their part to be an effective teacher. Teachers most commonly use digital tools to have students conduct research online, which was the focus of an earlier report based on these data.1 It is also common for these teachers to have students access (79%) and submit (76%) assignments online. More interactive online learning activities, such as developing wikis, engaging in online discussions, and editing work using collaborative platforms such as GoogleDocs, are also employed by some of the teachers in the sample. Overall, 62% of AP and NWP teachers feel their school does a “good job” supporting teachers’ efforts to bring digital tools into the learning process, and 68% say their school provides formal training in this area. Still, 85% of these teachers seek out their own opportunities to learn new ways to effectively incorporate these tools into their teaching. These teachers see disparities in access to digital tools having at least some impact on their students. More than half (54%) say all or almost all of their students have sufficient access to digital tools at school, but only a fifth of these teachers (18%) say all or almost all of their students have access to the digital tools they need at home. Teachers of the lowest income students are the least likely to say their students have sufficient access to the digital tools they need, both in school and at home. In terms of community type, teachers in urban areas are the least likely to say their students have sufficient access to digital tools IN SCHOOL, while rural teachers are the least likely to say their students have sufficient access AT HOME. Overall, while many AP and NWP teachers express concern about growing disparities across schools and school districts, they are divided as to whether access to digital tools is leading to greater disparities among their students. A large majority of these teachers (84%) agree to some extent with the statement that “Today’s digital technologies are leading to greater disparities between affluent and disadvantaged schools and school districts.” However, asked whether today’s digital technologies are narrowing or widening the gap between the most and least academically successful students, 44% say technology is narrowing the gap and 56% say it is widening the gap. These results indicate that while these teachers are concerned about how their students use the internet in general—and search engines in particular—to find information, they are confident in their own ability to use these tools effectively. In a similar vein, AP and NWP teachers use the online encyclopedia tool Wikipedia at much higher rates than U.S. adult internet users as a whole (87% vs. 53%). Wikipedia relies on user-generated, crowd-sourced content, a process that sometimes calls into question the accuracy of its information. In focus groups with teachers and students prior to the survey, Wikipedia was often noted as a tool teachers discourage or bar students from using because of concerns about the reliability of its content. These are among the main findings of an online survey of a non-probability sample of 2,462 middle and high school teachers currently teaching in the U.S., Puerto Rico and the U.S. Virgin Islands, conducted between March 7 and April 23, 2012. Some 1,750 of the teachers are drawn from a sample of advanced placement (AP) high school teachers, while the remaining 712 are from a sample of National Writing Project teachers. Survey findings are complemented by insights from a series of online and in-person focus groups with middle and high school teachers and students in grades 9-12, conducted between November, 2011 and February, 2012. This particular sample is quite diverse geographically, by subject matter taught, and by school size and community characteristics. But it skews towards educators who teach some of the most academically successful students in the country. Thus, the findings reported here reflect the realities of their special place in American education, and are not necessarily representative of all teachers in all schools. At the same time, these findings are especially powerful given that these teachers’ observations and judgments emerge from some of the nation’s most advanced classrooms. In addition to the survey, Pew Internet conducted a series of online and offline focus groups with middle and high school teachers and some of their students and their voices are included in this report. The study was designed to explore teachers’ views of the ways today’s digital environment is shaping the research and writing habits of middle and high school students, as well as teachers’ own technology use and their efforts to incorporate new digital tools into their classrooms. Data collection was conducted in two phases. In phase one, Pew Internet conducted two online and one in-person focus group with middle and high school teachers; focus group participants included Advanced Placement (AP) teachers, teachers who had participated in the National Writing Project’s Summer Institute (NWP), as well as teachers at a College Board school in the Northeast U.S. Two in-person focus groups were also conducted with students in grades 9-12 from the same College Board school. The goal of these discussions was to hear teachers and students talk about, in their own words, the different ways they feel digital technologies such as the internet, search engines, social media, and cell phones are shaping students’ research and writing habits and skills. Teachers were asked to speak in depth about teaching research and writing to middle and high school students today, the challenges they encounter, and how they incorporate digital technologies into their classrooms and assignments. Focus group discussions were instrumental in developing a 30-minute online survey, which was administered in phase two of the research to a national sample of middle and high school teachers. The survey results reported here are based on a non-probability sample of 2,462 middle and high school teachers currently teaching in the U.S., Puerto Rico, and the U.S. Virgin Islands. Of these 2,462 teachers, 2,067 completed the entire survey; all percentages reported are based on those answering each question. The sample is not a probability sample of all teachers because it was not practical to assemble a sampling frame of this population. Instead, two large lists of teachers were assembled: one included 42,879 AP teachers who had agreed to allow the College Board to contact them (about one-third of all AP teachers), while the other was a list of 5,869 teachers who participated in the National Writing Project’s Summer Institute during 2007-2011 and who were not already part of the AP sample. A stratified random sample of 16,721 AP teachers was drawn from the AP teacher list, based on subject taught, state, and grade level, while all members of the NWP list were included in the final sample. The online survey was conducted from March 7–April 23, 2012. More details on how the survey and focus groups were conducted are included in the Methodology section at the end of this report, along with focus group discussion guides and the survey instrument. Moreover, the majority of teachers participating in the survey (56%) currently teach AP, honors, and/or accelerated courses, thus the population of middle and high school students they work with skews heavily toward the highest achievers. These teachers and their students may have resources and support available to them—particularly in terms of specialized training and access to digital tools—that are not available in all educational settings. Thus, the population of teachers participating in this research might best be considered “leading edge teachers” who are actively involved with the College Board and/or the National Writing Project and are therefore beneficiaries of resources and training not common to all teachers. It is likely that teachers in this study are developing some of the more innovative pedagogical approaches to teaching research and writing in today’s digital environment, and are incorporating classroom technology in ways that are not typical of the entire population of middle and high school teachers in the U.S. Survey findings represent the attitudes and behaviors of this particular group of teachers only, and are not representative of the entire population of U.S. middle and high school teachers. Every effort was made to administer the survey to as broad a group of educators as possible from the sample files being used. As a group, the 2,462 teachers participating in the survey comprise a wide range of subject areas, experience levels, geographic regions, school type and socioeconomic level, and community type (detailed sample characteristics are available in the Methodology section of this report). The sample includes teachers from all 50 states, Puerto Rico, and the U.S. Virgin Islands. All teachers who participated in the survey teach in physical schools and classrooms, as opposed to teaching online or virtual courses. English/language arts teachers make up a significant portion of the sample (36%), reflecting the intentional design of the study, but history, social science, math, science, foreign language, art, and music teachers are also represented. About one in ten teachers participating in the survey are middle school teachers, while 91% currently teach grades 9-12. There is wide distribution across school size and students’ socioeconomic status, though half of the teachers participating in the survey report teaching in a small city or suburb. There is also a wide distribution in the age and experience levels of participating teachers. The survey sample is 71% female. The Pew Research Center’s Internet & American Life Project is one of seven projects that make up the Pew Research Center, a nonpartisan, nonprofit “fact tank” that provides information on the issues, attitudes and trends shaping America and the world. The Project produces reports exploring the impact of the internet on families, communities, work and home, daily life, education, health care, and civic and political life. The Pew Internet Project takes no positions on policy issues related to the internet or other communications technologies. It does not endorse technologies, industry sectors, companies, nonprofit organizations, or individuals. While we thank our research partners for their helpful guidance, the Pew Internet Project had full control over the design, implementation, analysis and writing of this survey and report. The National Writing Project (NWP) is a nationwide network of educators working together to improve the teaching of writing in the nation’s schools and in other settings. NWP provides high-quality professional development programs to teachers in a variety of disciplines and at all levels, from early childhood through university. Through its nearly 200 university-based sites serving all 50 states, the District of Columbia, Puerto Rico and the U.S. Virgin Islands, NWP develops the leadership, programs and research needed for teachers to help students become successful writers and learners. For more information, visit www.nwp.org.